The term digital assets refers to any digital or online accounts and the data held within, which may include personal information and/or critical data about our lives. In some cases, these digital accounts may also contain financial assets that others don’t even know exist. In addition to social media profiles, many people keep a blog, or an online resume or portfolio, which houses their personal stories, professional experience, and creative projects they’ve worked on during their lives. Each account that we sign up for typically requires basic to detailed personal information to be input before joining the program, which is then stored online until we decide otherwise. It’s important to consider what will happen to the information you have saved in a digital file or online long after you’re gone. Will your files be available to those who need them? And, will they be kept private from those who shouldn’t have access? Use a Digital Asset Management Tool. Research your options, and choose a tool that you feel most comfortable with. Many of the available tools offer free trials, so you can try them out risk free, and then choose the one you like best, and one that fits within your budget. Don’t put it off. You don’t have forever, after all. Start thinking about what you want to happen to your data and other digital assets when you die. The sooner you start the planning process, the better, as we never know how long we have on this earth. 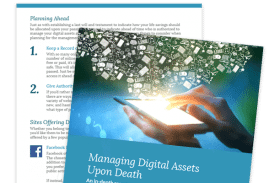 Need more information on managing digital assets upon death? Check out our FREE resource.